Located as it is within an easy 30 kilometres from Lisbon, Sintra is one of Portugal's most popular attractions. It's a small village listed on the Unesco World Heritage list for its Romantic 19th century architecture. Even before the 19th century, Sintra was a popular vacation escape for the Portuguese monarchy and aristocracy, who added their mark to the landscape by building wonderful palaces (among them two royal ones), chalets and a castle. Sintra can be visited in an one day trip, catching a 45-minute train ride from Lisbon, or you can stay in the village for 2 or more days in one of the many guests house in and around the village. The highlights of Sintra are its landscape and historical monuments. There are some monuments that shouldn't be missed, like the Pena Palace, the Quinta da Regaleira, the National Palace of Sintra, the Monserrate Palace, the Convent of Capuchos, the Moorish Castle and the view from the Seteais Palace. Sintra is an example of 19th century Romantic architecture, a style which is ornate and colourful. For this architecture styling, the town was made a UNESCO heritage site. Through the years the town has attracted to those drawn to the fantastical, from fairy-tale writer Hans Christian Anderson, who called the town the “most beautiful place in Portugal,” to romantic and tragic poet Lord Byron, who called it a “glorious Eden.” The central area is a 15-minute walk from the train station, and has a number of shops, cafes, restaurants and museums, including the Palacio Nactional de Sintra (see below). A tourist centre is located down from the main square at the end of Parca da Republica where you can get a map and information on the sites of Sintra. The Quinta da Regaleira is a unique monument that was designed by Luigi Manini (Count of Fagagna) and was owned by Carvalho Monteiro. It has a palace and a big garden, with lots of tunels, small lakes, towers and open spaces. It's very connected with the masonic movement. One of the important spots there is the Poço Iniciático. The national palace in Sintra is located in the centre of Sintra, and is hard to miss with it massive two white chimneys towering above the rest of the historic centre. The origins of the building date back to the 9th century, constructed by the Wallis, the Moorish governors of Sintra at the time. The original Arab style can still be found in the building, but many remodellings and expansions have added in other architectural styles, predominately Manueline and Gothic. The Palace today is a museum and tourist attraction. Opening Hours: 10:00am - 5:30pm (Last Entry: 5:00pm) Monday - Sunday, excluding Wednesdays when it is closed. Admission: €4. Pena Palace, sitting atop a steep hill overlooking Sintra, is the “exuberant creation” of Queen Maria II of Portugal and her consort, Fernando of Saxe-Coburg Gotha. It is the epitome of the Romantic architecture, an ornate and eclectic decorative style - a mix or architectures including Renaissance, Baroque, Moorish, Gothic and Manueline. The interior of the Palace holds a museum with various artefacts and recreations of what the Palace would have looked like when it was used by the Portuguese Royal Family. Surrounding the Palace is the Pena Park, a 85 hectare site that brings together plants and trees from around the world. There are a number of paths through the park. A park guide and map is available on purchasing a ticket. Opening Hours: 16 Sept -30 June 10:00am - 5:30pm / 01 July - 15 Sept 10:00am - 7:00pm. Last Entry: 1 hour before closing. Admission is €7.00 for admission to the palace and park. Pictures are not allowed inside the palace, but otherwise are allowed on the grounds and outside the palace. 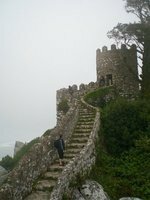 To get there, you can hike up from the town in about 30 minutes, or take bus 434 from Sintra station to the Palace (tickets bought on board for €4). The Moorish Castle, standing on a peak overlooking Sintra, had its beginnings as a military fort, believed to date back to the 9th century and the period of Arab occupation. It served as an excellent observation post for monitoring the coastline for attack, and because of its cliff-top location was hard to attack and easy to defend. It has past through a number of hands since then, including passing to the Portuguese crown in Dom Afonso Henriques in 1147. Henriques built Romanesque Chapel of São Pedro just outside the walls of the castle. Today the castle is mostly in ruins, but the walls still remain and offer excellent views of the surrounding countryside. Opening Times: 9:30am - 6:00pm every day, with last entry at 5:00pm. Admission is €3.50. To get there, take you can hike up from the town in about 30 minutes, or take bus 434 from Sintra station to the Palace (tickets bought on board for €4). Located outside Sintra, the neo-classical buildings are now a luxury hotel, but still worth a trip to see the ornate styling. Nineteen kilometres from Sintra is Cabo da Roca, the western most point in mainland Europe. The high rocky point offers good views of the sea. There is a gift shop and cafe at the point. The festival of music and dance takes place every year in June and July. Between June and July, the UNESCO World Heritage site of Sintra hosts some of the finest ballet dancers, pianists and chamber musicians during this cultural celebration. Past performers have played for the likes of Paris’ chamber philharmonic and Lisbon’s Gulbenkian Orchestra. Former palaces, churches, parks, and country estates are among the festival’s stately venues. Lisbon is the closest major city with an airport. From Lisbon Airport a bus, train or car is the best way to get to Sintra. If you are in the centre of Lisbon, go to Rossio train station and catch the train that goes to Sintra. There is a train every 20 minutes. The one way ticket costs €1.80. Go to the end of the line. Coming from Oriente station or towards the north, the line through Oriente, Areeiro, Entre Campos and Sete Rios (near Jardim Zoologico metro stop) goes to Monte Abraao, where you can transfer to the train to Sintra. Sintra is on the IC-19 road to Lisbon. The IC-19 is a major commuter route, and congestion is common on the road. Bus 418 connects Sintra with Estoril and bus 417 runs to Cascais. Both of these buses have hourly departures from Sintra’s main bus station at Portela da Sintra. 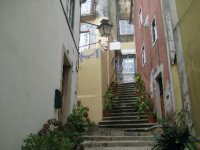 The historic centre of Sintra is small enough to walk. To get to the tourist attractions outside the centre, bus, walking or driving are options. The IC-19 runs into Sintra. Drive up the Volta do Duche to get to the Historic Centre. Estrada de Pena is a circle road the runs up by both the Moorish Castle and the Palace of Pena. Bus 434 runs from Sintra train station along the ring road to the Palace and Moorish Castle. Tickets bought on board for €4 for the whole day. From the train station, walk along Volta do Duche to get to the historic centre. To get to the Moorish Castle or Palace of Pena, take Rua Marechal to the Santa Maria church, and then take the walking path (Rampa do Castelo). The path is dirt and stone steps, but is well maintained. The path will pass close by the Moorish Castle, and then onward to the Palace of Pena (with a short jaunt along the ring road). You cannot leave Sintra without trying two pastry specialities. One is the Travesseiro and the other is the Queijada de Sintra. You can try the first ones, in the most famous café in Sintra, Piriquita, localized in the centre of the Vila. Queijada de Sintra you can find in almost every café in Sintra, but the famous ones are from Sapa or Gregório. Sapa is localized in the beginning of Volta do Duche. Gregório is in the main road that connects Vila de Sintra with São Pedro. The main one, not the road that starts in the historic centre. If you are on a budget avoid the restaurants in the historic centre, they are expensive. Try to meet locals or ask anyone a cheap and good spot to eat well. We have a comprehensive list of accommodation in Sintra searchable right here on Travellerspoint. You can use our map to quickly compare budget, mid-range or top of the range accommodation in Sintra and areas nearby. This is version 28. Last edited at 3:01 on Aug 2, 17 by sleepBot. 3 articles link to this page.